I was watching television last night when there was someone from the Religious Affairs Ministry talking about the history of Maulud Nabi or as we now call it Maulidin Rasul - the ceremony to commemorate the birthday of Prophet Muhammad SAW. I was quite intrigued as he was talking about how grand the first celebration was which was surprisingly a few hundred years after the death of the Prophet. It seemed that the first tribe to hold the ceremony was Bani Ubaid Al-Qoddakh who call themselves 'Fatimiyyah' and this tribe came from the Syiah Rafidhah. They entered the City of Cairo in 977 (362 Hijra) and since then the practice of holding maulid spread. By the 7th century Hijra, King Mudhafir Abu Sa'ad Kaukaburi held a huge celebration which was said to be prepared with 5,000 roasted meat, 10,000 chickens, 100,000 glasses of milk and 30,000 plates of dessert. One of my father's old friends asked us when we arrived in Tutong for a Tahlil the other night "hujan di Brunei?" loosely translated "did it rain in Brunei?" When I was much younger, the first time I heard that I was taken aback. We were in Tutong - it's as if Tutong is in a different country. A wise guy would be tempted to say something along that line. But I refrain from doing so as I discovered that this is pretty common among my relatives and friends who are not staying in the Brunei district. Someone from Belait, Seria or Tutong or for that matter, even from Muara would say "ke Brunei" or "to Brunei" when they are referring going to the capital Bandar Seri Begawan. This stemmed from the olden times when Brunei Town was the name of the city centre. Going to Brunei just means going to Brunei Town. 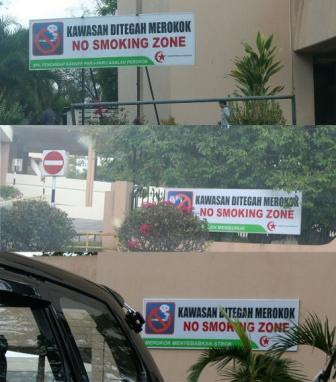 Do you know that RIPAS hospital is now officially a “No Smoking Zone”. There are billboards placed at every major entrance to RIPAS Hospital to remind people of this fact. This is one of many initiatives of the Ministry of Health in promoting a healthier lifestyle in our country, one of which is staying tobacco free. Unfortunately there are still many people smoking in the hospital especially outside the wards and waiting areas. Either smoking causes selective blindness to these signs or these smokers just choose to ignore the signs. Picture shows a man outside the labour room with kids behind him. 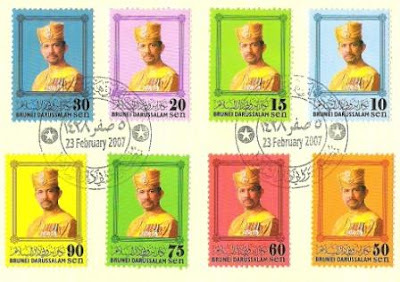 On the Friday (23rd February) just before the 23rd National Day celebrations this year, the Postal Services Department released the new Brunei definitive stamps. Not many people seemed to have realised it but then in the era of the internet and skype, not that many Bruneians used the traditional communication methods anymore such as letter writing. As for me, other than for sending out Hari Raya cards, Christmas cards or Chinese New Year cards, I don't remember any other times I actually buy postage stamps. It was 10 years ago when the last design was released. For the postage stamps knowledge challenged, definitive stamps are the stamps which are always available at the post offices as compared to commemorative stamps which are issued occassionally which the post offices will stop selling once their stocks run out. Definitive stamps are by design changed only if the designs have become too old or in Brunei's case, there are changes to the photographs of His Majesty. I read on the internet about the recent World Water Day and the ceremony that was held at Brunei's oldest dam - the Tasek Dam. The Tasek Dam located in the heart of the capital, completed in 1964 marked a major milestone in the history of water supply in Brunei. Until then, there was no major water supply but with the Tasek Dam, it was the first main source of water supply to Pekan Brunei. The Tasek Dam was officiated by Al-Marhum Sultan Haji Omar Ali Saifuddien Saadul Khairi Waddien III on 13th February 1965. Most people by now would have known our capital, Pekan Brunei was renamed Bandar Seri Begawan in honour of Al-Marhum Sultan Haji Omar Ali Saiffuddien Sa'adul Khairi Waddien the Third, the 28th Sultan. If not, then you can read it at this post here. 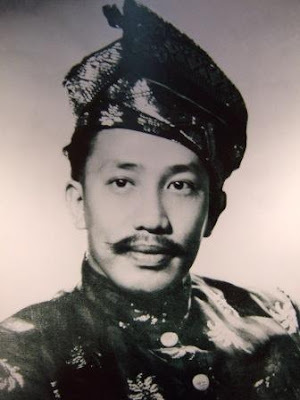 The name Seri Begawan Sultan was used by His Majesty when he abdicated or stepped down from the throne in 1967 thus installing His Majesty Sultan Haji Hassanal Bolkiah Muizzaddin Wadaullah as the 29th Sultan. Begawan is the title used to denote someone who has 'retired' for Bruneians though it has a slightly different meaning in standard Malay. Thus if you are titled Pehin Khatib and you have reached retirement age your title changed to Begawan Pehin Khatib. 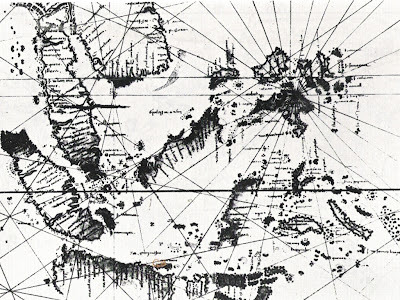 Thus in Sultan Haji Omar Ali's case, he becomes Begawan Sultan. You know, a lot of people are still finding the Kiulap Roundabout to be difficult to go through. After spending four days on the Indian road, we discovered that they have a fool proof method when going through roundabout. If you are entering into a roundabout, you have the right of way, so you can ignore all the cars going around the roundabout - they have to stop for you coming in! The first time I saw it, I had a big shock when I saw cars not stopping at all but just zooming through entering the roundabouts. Even though the Indian authorities tried to get 'our' style by putting up roadsigns for the entering cars to give way to traffic from the right, so far that does not seem to have any effect whatsover. YPI would have an interesting time taking photographs in India. So I leave you with some of the interesting traffic photographs on Indian roads. How many people can you fit into your bus or taxis? But it's not just taxis that are overloaded. Just arrived in Brunei yesterday afternoon. I haven't had the time to do a proper post yet, so I am uploading some of the photoshoots I took of the Taj Mahal and its surrounding areas. Note that the Taj Mahal itself is made out of white marble which was shipped in from about 300 km away but the rest of the buildings in the complex are made out of red stones available around the area. Hope you enjoy the photographs. Just in case there is anyone out there searching for the Friday, 23rd March 2007 posting - there will be none. I have not figured out a way of how to post when I am 40,000 feet up in the sky just yet. Yesterday we had some spare time, while waiting for our counterpart to prepare the text and go through the final process of cleaning up the languages, grammar etc for our signing later today, we thought why not go somewhere. And we did. We went to Agra to visit one of the World's seventh wonders - the Taj Mahal. The Taj Mahal was built about 400 years ago and took 22 years and 20,000 people to build it. It was built because a King loved his wife so much that he built one of the finest masoleum for her out of white marble. There was a myth that he actually wanted to build another one for himself out of black marble just across the river. If that was true, he was unable to carry it out as he was deposed by his son and imprisoned. He is buried to the left of her in the Taj Mahal. Will the Brunei Economy Grow in 2007?